White River attracts people from across North America who want to experience the rugged and picturesque beauty that Northeastern Ontario has to offer. Located midway between Thunder Bay and Sault Ste. Marie, White River offers an abundance of wilderness areas, including beautiful fresh water lakes and rivers, providing an ideal outdoor recreational experience. From swimming, boating, fishing and hunting in the summer to snowmobiling, cross-country skiing and showshoeing in the winter months, White River has an outdoor activity that will appeal to everyone in the family! There is no better way to explore the beauty of White River's boreal forests than ATV'ing. Immerse yourself in a true Northern experience! ATV'ing offers access to remote areas for fishing, hunting and camping. White River is the ideal location for avid snowmobilers. We are located on the TOPS snowmobile trail system, allowing you access to other nearby communities. It makes for a fun day trip or overnight adventure. 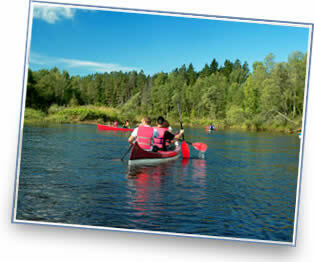 Enjoy our vast lake and river systems with friends and family. Boating during the summer months is a favourite passtime of many residents of White River. Snowshoeing is one of the best ways to not only discover White River's untouched forests, but it is a great way to stay in shape! With many nearby parks (including Pukaskwa), and inland lakes, camping offers families the opportunity to experience the great outdoors and spend time together away from it all. Here's a chance to get out on the water and take in the beauty of our lakes, rivers and surrounding areas. Make a day of it by planning a picnic or an overnight stay at one of our many local lodges. Fishermen will not be disappointed with the opportunities to reel in a Walleye, Bass, Pike, or Lake Trout. Our lakes and rivers are teeming with fish. Whether you hunt birds, small or large game, White River is a beacon for hunting enthusiasts. We attract a large number of moose hunters every fall! More and more families are getting out to cross-country ski during the winter months. Again, a wonderful opportunity to take in the peace and solitude of our forests, while staying in shape. White River has many hiking trails that loop through our forests and around our lakes and rivers. Whether you're interested in a short outing or an extended hike, we have a host of trails.